Writing a great social media manager job description is not an easy task. The job description is one of the first few things potential applicants read and a well-written job description can increase the chances of you hiring the best social media manager for your company. 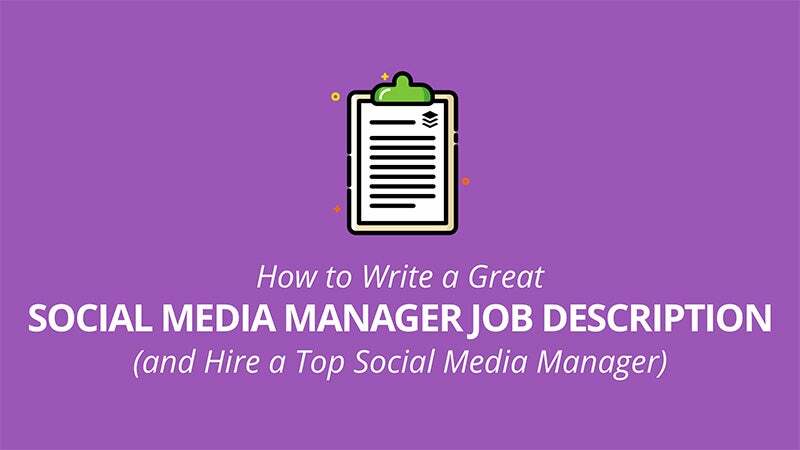 Here’s everything you need to know about writing a great social media manager job description and more. A detailed job description helps you and the candidates set the right expectations about the role. So what should go into your job description? This section is a brief introduction of your company or team. This is helpful especially if you intend to list the job description on external job boards where potential applicants might not know your company. Some of the things you can include in this section are: what your company does, how it’s like working at your company, what your company culture is like and what your company values are. While it’s possible that applicants already know your company, this is a great opportunity to promote your company and entice them to want to work with you. What are the unique characteristics of your company that will get your applicants excited about working with you? Is it your great company culture and team? Or amazing growth and investor support? This section contains general information about the role such as the title, the team lead that they would report to, any direct reports and location of the job. The title is a fun one to think about. Depending on your company culture, it can be as straightforward as “Social Media Manager” or as creative as “Social Media Ninja”. I’d recommend keeping the title straightforward as it can help set clear expectations for the role. A creative title is perfectly great, too, as long as you have a clear job description. Social Media Today has written a fun article on three groups of common social media job titles -- Traditional, Modern and Hyper-Modern. If you are stuck with naming the title, you might find the article helpful. 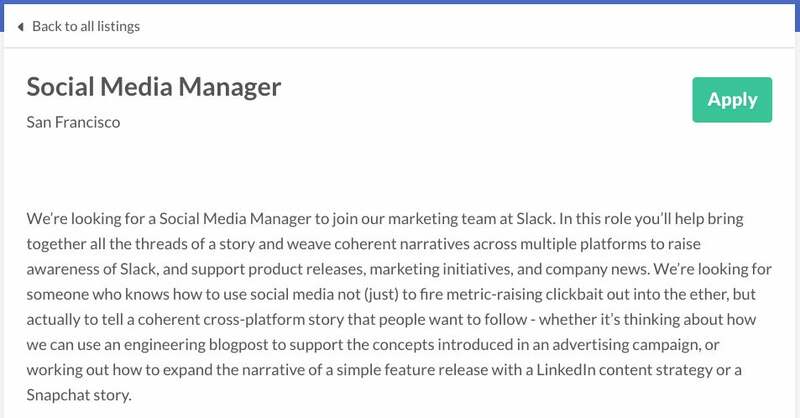 If the new social media manager will be reporting to a team lead or will be managing a team, it’ll help to mention the title of the team lead or the roles on the team respectively. I personally think that adding the name of the team lead or the team members will add a nice personal touch to the job description. Also, if the team lead or any of the team members are well-known in the industry, it can help to make the job even more desirable. Will the new social media manager work in your office? Or can she work remotely? Or perhaps a mix of both? The location can matter a lot to applicants, especially if they have to move their families. If the new social media manager has to relocate to where your company is based, will the company sponsor the relocation or help in any way? Being clear about this helps people decide if they’d want to apply in the first place. It can save both the applicant’s and your time when people who don’t want to relocate and wouldn’t be able to work remotely, don’t apply. This section gives the applicants a high-level view of the job. Usually, it’s tricky to list all the responsibilities of the role, especially when the list could change over time. Having a high-level description of the role helps applicants understand what’s generally expected of a person in the role. The idea here is not to be too specific about the role such as mentioning all the day-to-day tasks (such details will be covered in the next section). This section is where you’d want to be more specific about the requirements of the job. While you might not be able to list all the tasks for the job, this section will give the applicants a sense of what they’d do in the role on a day-to-day basis and what skill sets you’re looking for. As you might have noticed, the responsibilities of the role all start with an action verb as they are meant to be actionable. 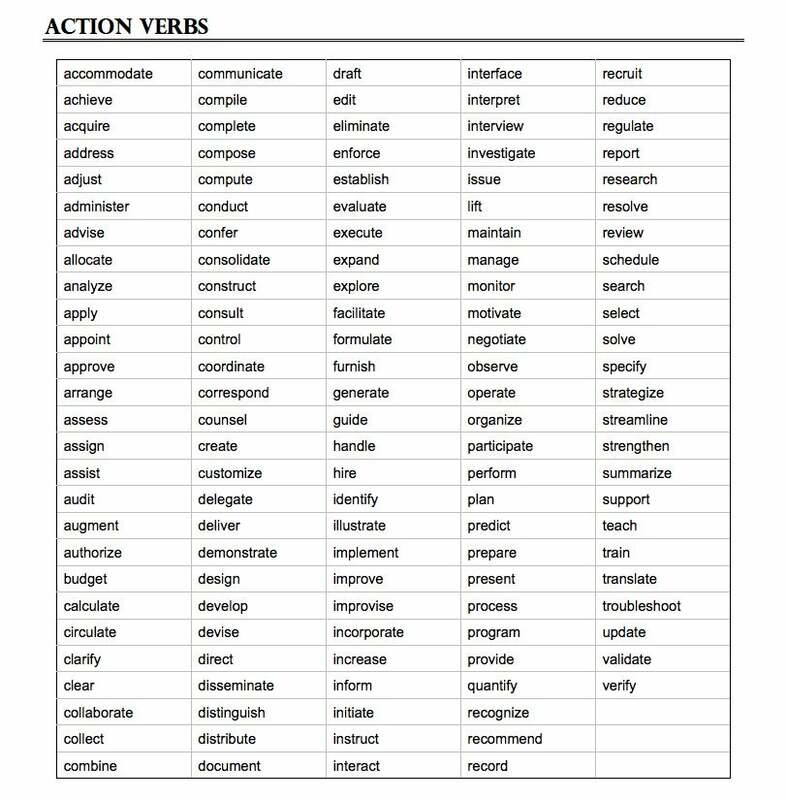 The Human Resource department of the University of Pittsburgh has come up with a great list of action verbs you can use in your job description. This section goes another level deeper than the responsibilities section as you’d state the metrics the new social media manager will be responsible for. While I don’t see many job descriptions with such a section, I can see how it will bring extra clarity to the job description for applicants. Depending on your management style or if you are higher for a senior position, you might prefer the new social media manager to come up with her own KPIs, instead. 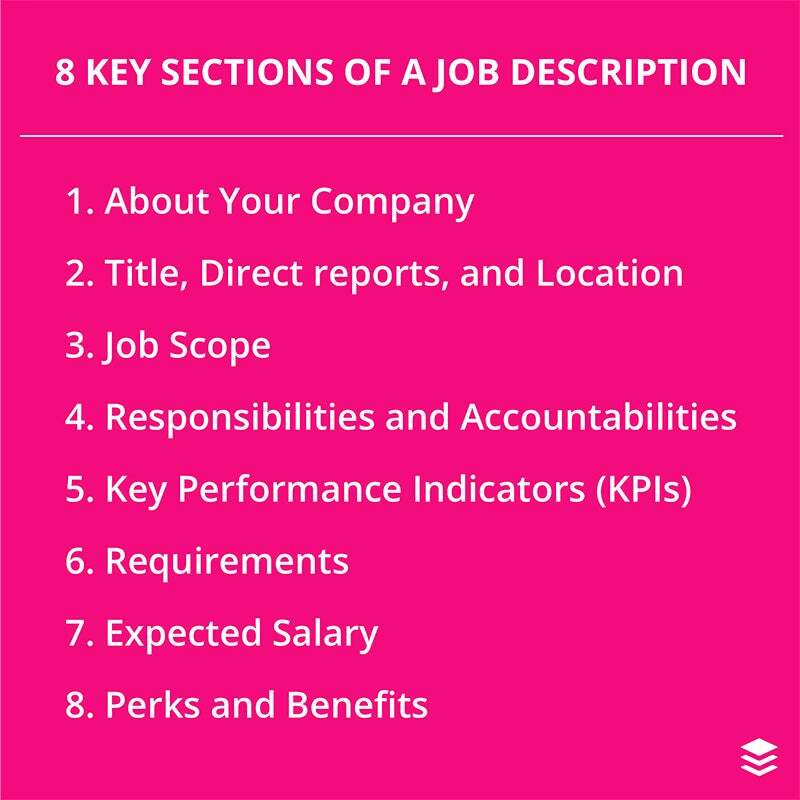 If you intend to list KPIs in the job description, we’d love to help you brainstorm some potential ones to use. Here’s a big list of 61 social media metrics and their definitions for your reference. Requirements are helpful when you are hiring for a mid to senior level position and would like to encourage only people with a certain level of experience and skills, to apply. It will send a clear signal to potential applicants that you are hiring for a senior position. When hiring for senior positions, companies would often state a minimum number of years of experience in the related fields. I believe this might be used as an indication of how senior the position is. In this section, you could also ask for examples from the applicants’ past experiences that they think might show they have met your requirements. A study by Smart Recruit Online, a recruitment software company found that “companies see an increase in candidates by 30 percent if they include wage information in their job ads." This can be a good reason to state the expected salary on the job description. That said, you don’t have to state the exact salary. Including a salary band, such as $65,000 to $90,000, is quite a common practice. You could research on websites such as PayScale and Glassdoor to find out a rough salary range. 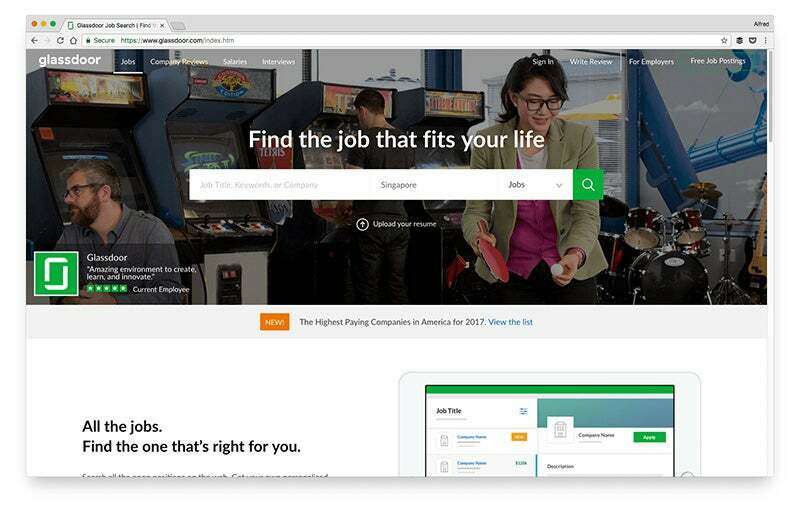 For example, after you search for the role on PayScale, you can add your city, preferred experience level and even the skills you’re looking for. 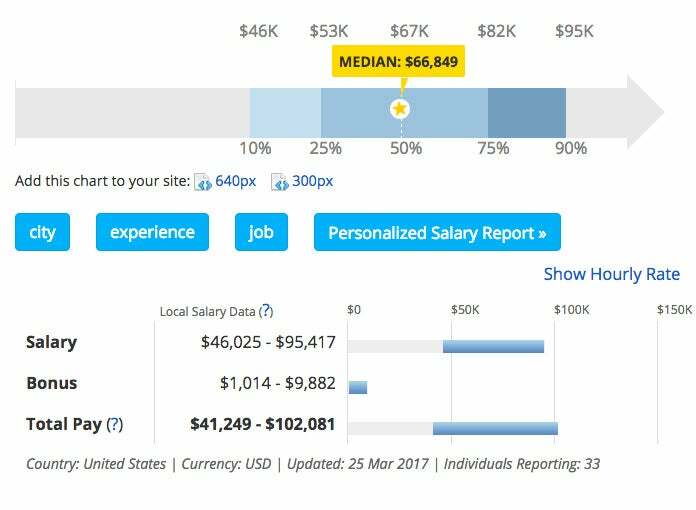 PayScale will provide the average salary and the range of salaries according to your specifications. Finally, you might also want to include the perks and benefits of the role. Having them on your job description works great if you are intending to list your job description on external job boards. 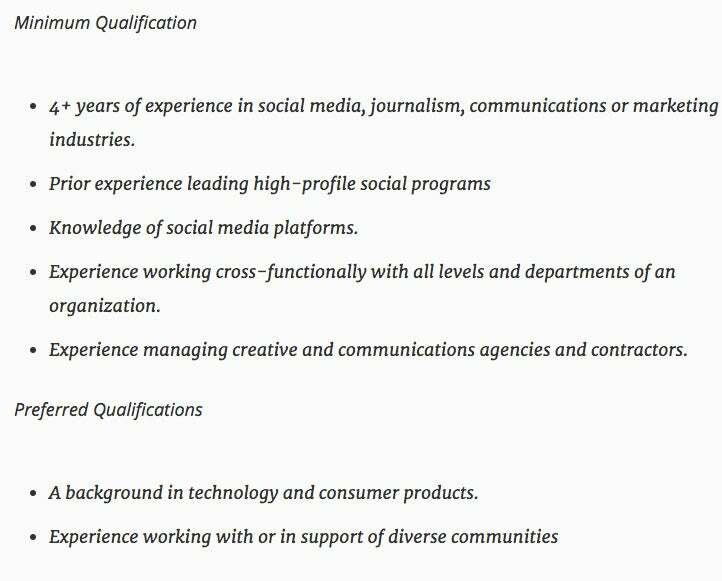 From my research, I noticed that Monster has many job listings for the social media manager role. Feel free to check it out here if you’d love to refer to more job listings. Knowing what to include in your job description is a great first step. The next step is to knowing how to make it great. Fortunately, there are many great resources and tools that can help you succeed in creating your best social media manager job description. We’ve curated several tips, templates and tools for you. I like Help Scout’s suggestions for a job description (even though they were written in a hiring guide for a customer service team). If you are keen to learn more, the guide goes on to elaborate each of the points. It can be tempting to over-promise in your job description to attract more applicants. A blog post from Hired, a job search marketplace, recommends being honest with the job description. 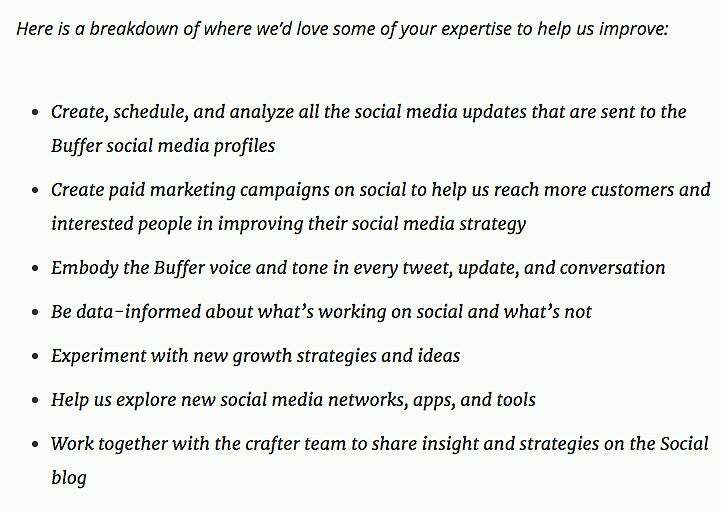 If you prefer referring to actual social media manager job descriptions, I found that Monster has quite an extensive list. 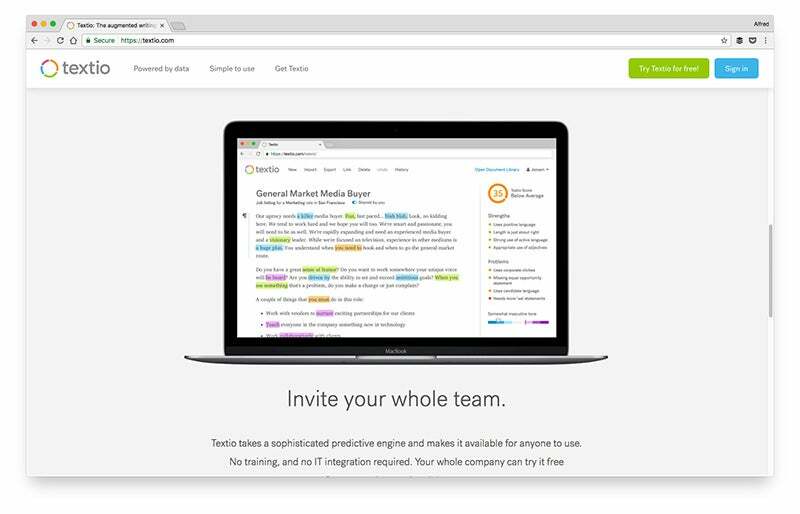 Textio is a writing platform built specifically for creating highly effective job descriptions. It analyzes over 10 million job posts and their hiring outcomes to predict the performance of your job description and provide you with suggestions to improve it. Once you’ve written up your job description (well done! ), you might choose to list it on your company’s career page and/or post it to external job boards. If you’d like to spread your job post far and wide, here’re several job boards to consider. Glassdoor not only allows you to post your job descriptions on their platform but also provides reviews of your company which can be a great way to attract the right talents. It also provides salary estimates based on the job title and location to help you set the appropriate salary. 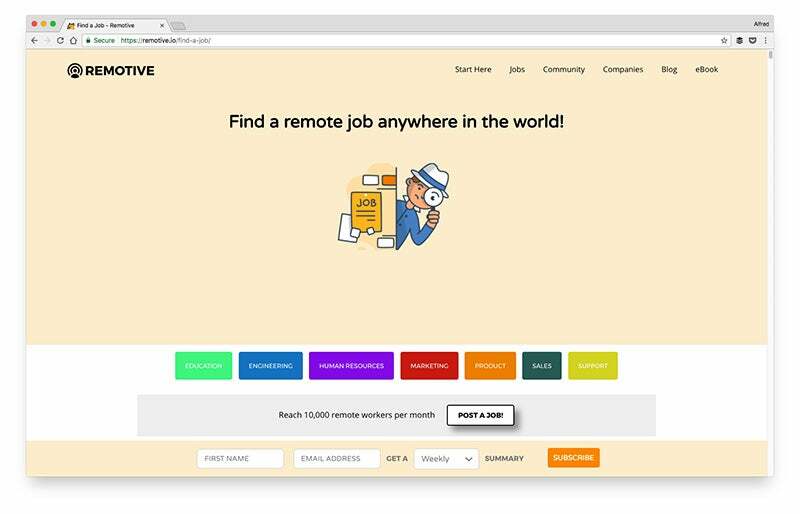 Remotive is a community of more than 25,000 remote workers, which makes it a great place if you are looking to hire a remote social media manager. It has a job board of handpicked remote startup jobs. Jobs listed on the Remotive job board get an average of more than 300 clicks per month. 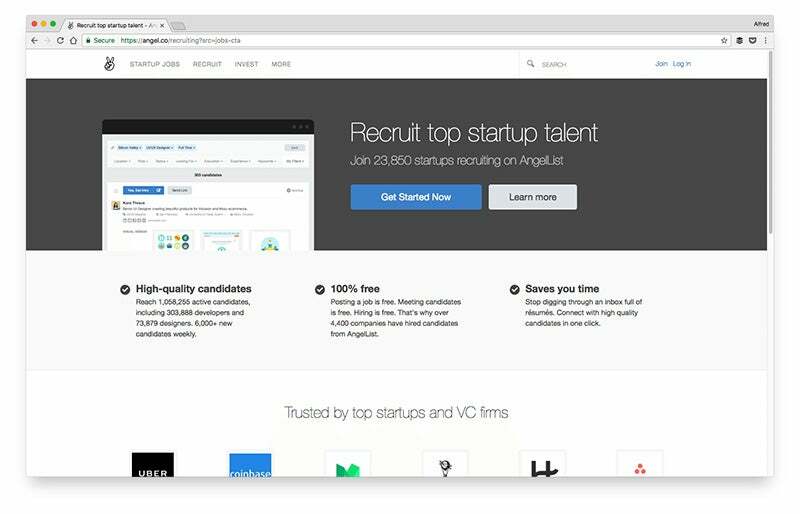 AngelList is one of the more popular startup job boards, with more than one million people actively looking for a new job. Posting a job on and hiring through AngelList is currently free! 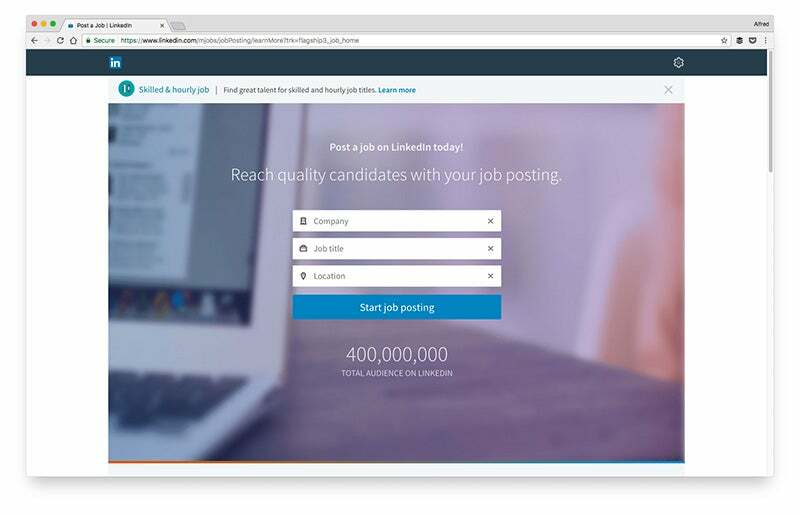 Social media sites like LinkedIn can be a great option for listing your job posts, too. When you list a job post on LinkedIn, LinkedIn would show it to professionals whose skills and experience match your requirements, based on the data LinkedIn has. Other options: Jobs on Facebook or in relevant, niche Facebook Groups; we used to tweet our job posts, too. Once you list your job descriptions on job boards, you will soon get applications streaming in -- yay! One of the next steps could be to set up an interview with the applicants. Conducting a job interview can be quite daunting for the first few times. Something I’d worry about is if I had asked the right questions. Their answer will show their level of ownership of a project, and how they talk about the results -- was it a success for them because of the quality of the finished product or the results of the finished product? -- this speaks to how much they are data/impact-minded. Hat-tip to Carol Meyers, CMO of Rapid7, who shared this question during her GrowthHackers AMA. The candidate’s answer here might give us a hint if they have the qualities we are looking for. Their answer will give us a sense of how they would own and manage the paid channel if the ownership was given to them. The way they break down the budget might also show how analytical they are. The answers to these three questions will tell us how in tune they are with the social media landscape and how knowledgeable they are about social media marketing. This will give us an understanding of how they view social media and what success on social media is to them.